Federal Levies KPK Swat Computer Operator Junior Clerk Sipahi Jobs 2019 has been announce. Last date to apply is Saturday, December 15, 2018. Swat levies force is the most important law enforcing agency in Swat District. It is responsible for not only maintaining law and order situation, traffic management but also enforcing hundreds of local and special laws including price control, anti-encroachment and municipal laws etc. Apart from this, it coordinates and cooperate with other law enforcing agencies including Pakistan Army and Frontier Constabulary etc. What sets levies apart from all the other LEAs including Police is that levies has got a multi-dimensional role to play ranging from maintaining law and order to undertaking rescue operations in disasters and from commissioning disaster management operations to helping Executive Magistrates in checking the quality of food stuff, anti-narcotics operations, price control, inquiring and solving public complaints. Total of 8 vacancies are announce in Federal Levies KPK Swat force. Candidates having domicile of Swat are eligible to apply. All those candidates who are eligible for Federal Levies KPK must apply to grab this golden opportunity. Terms & conditions as well as other requirements for Federal Levies KPK Jobs are describe below. 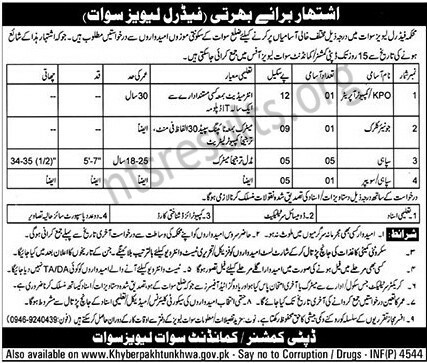 How to Apply For Federal Levies KPK Swat Computer Operator Junior Clerk Sipahi Jobs 2019 ? Government employer apply through proper channel. Only short listed candidates will be call for test / interview / physical test. Candidates shall submit Application, along with attested copies of id card, domicile as well as two passport size photographs. Department has the right to increase or decrease the post or cancel the recruitment process. Last date to apply is Saturday, December 15, 2018.